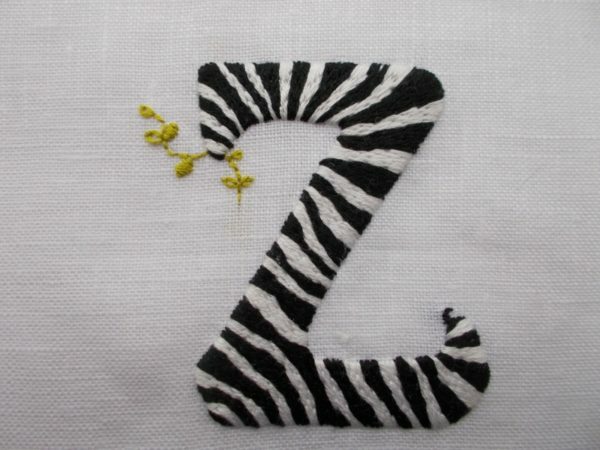 Embroidering a Z with zebra stripes was just too irresistible … and anyway the zebra is a spectacular animal worthy of celebration in its own right. Although still often raised as a subject of debate, the question whether a zebra is a black animal with white stripes or a white animal with black stripes was solved hypothetically as long ago as 1977 when an Edinburgh embyologist, J.B.L.Bard came down on the side of a black animal with white stripes. * Embryological research has since confirmed this; embryos begin dark and then lighter stripes appear. Stripes arise from melanocytes or specialised skin cells which transfer melanin, a skin darkening pigment, into the animal’s fur – those that contain melanin appear black, those without are white; the skin beneath the stripes is always dark. Then this week, I read in The Times (21 February) that research at Bristol University has shown that the adaptive function of those stripes is most likely to dazzle and bewilder nasty parasitic insects. It seem the stripes play havoc with the horseflies ability to land. Many hover around the animal, some car crash straight into it but very few achieve a successful landing. The theory was tested out by horses dressed in zebra coats where the result was notable for the strength of the effect. In today’s Times a letter from Suzanne Chipperfield (of the circus family) who has worked with both horses and zebras confirms that she had too noticed her horses and ponies attracted many flies while the zebras didn’t; she will now be providing striped rugs for her horses. Interestingly, the Royal Navy was keen on painting their boats with dazzle patterns during WWI which they thought made their ships a more difficult target. Speed, direction of travel and distance became more difficult for the enemy to judge when the ship was broken up visually, so fewer missiles hit the target. Not so different from those pesky mosquitoes or tsetse flies then! See Edward Wadsworth’s engravings of dazzle ships. 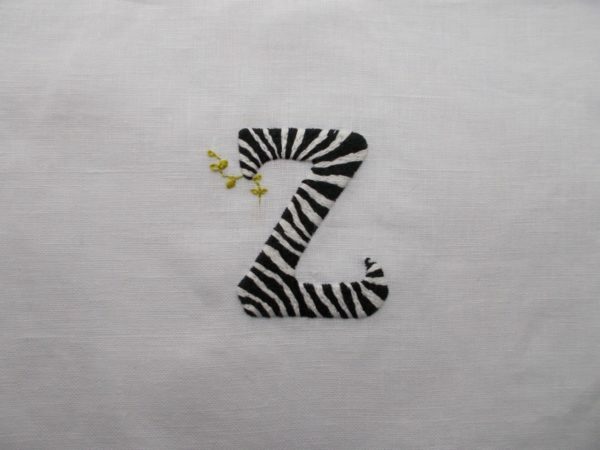 Wonderful, Mary your Z is a “zuper” zebra. So interesting about the stripes being white over black. Reminds me of the Lippizaner horse used by the Spanish Riding School in Vienna. The mature horses are white (known as grey) but start as foals with black coats. What are we going to look forward to now that you have finished the alphabet? With the Lippizaners perhaps it’s inhibition of melanin again – you’ve got me interested now. 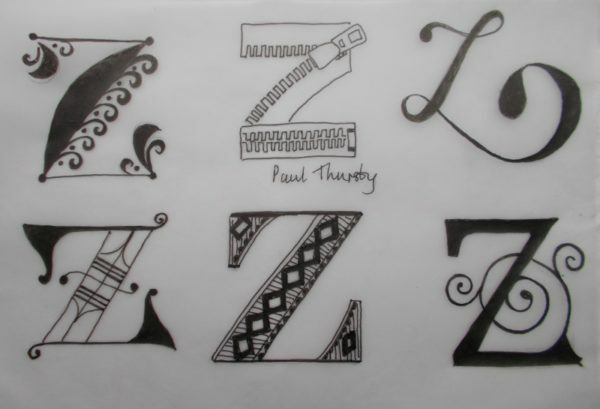 Next, I’m going to do another alphabet – this time in whitework. An individual letter each week is ideal until the altar frontal is finished. Glad you liked the Zebra! Love the little bit of browse for your zebra! It was irresistible … so I didn’t resist! Very interesting. I had heard that the stripes confused predators when the zebras were in a group. Though I suppose the predator is still likely to get one individual, whereas it’s win win for all zebras if stripes keep flies off. 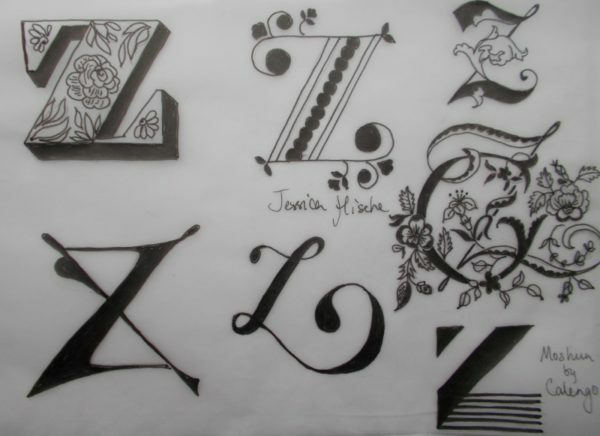 So nice to look back and see all of the beautiful letters in this alphabet. You did a lovely job. I will be renovating my summer wardrobe. How clever of you, I hadn’t thought of that – but if a striped blanket works for horses, why shouldn’t it work for us (though mosquitoes do see to find those areas where the edge of one garment doesn’t quite meet that of another)!